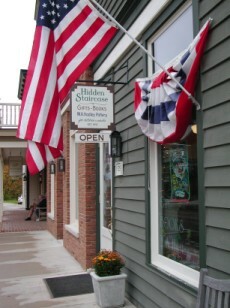 Hidden Staircase is a specialty shop offering many fine gift items that include: M. A. Hadley Pottery, cross-stitch and quilting items, to over fifty thousand book selections. M. A. Hadley Pottery, the pottery with the whimsical designs to suit any decor . And best of all it can be personalized for any gift occasion! Quilting and Cross-Stitch for the crafter at heart. We offer many fine cross-stitch patterns from your favorite designers along with floss, kits, linens, and other supplies. Also, check out our quilt kits, fat quarters, cards, books, mugs and tiles. NOTE: ONLY AVAILABLE ON-LINE.